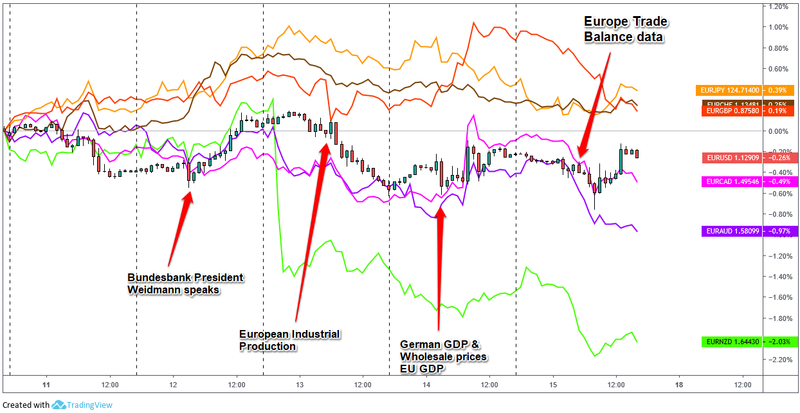 Being neither viewed as a “safe haven” or “risk-on” asset, the euro was once again in the middle of the pack, influenced this week by both global risk sentiment and European data and headlines. First, we’ll briefly touch on global risk sentiment, and for a general rundown of what drove traders broadly this week, check out my review of this week’s risk sentiment drivers and broad market behavior in my Japanese yen weekly review here. In short, we saw broad risk-on sentiment to start the week and dominated almost all the way through Friday as traders seemed to focus on the improving geopolitical risks related to the U.S.-China trade negotiations and the avoidance of another U.S. government shutdown with a new border security bill. 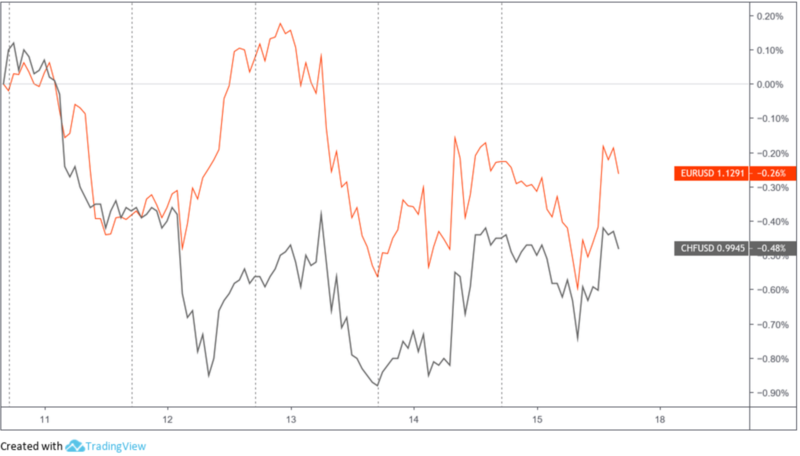 Both stories have been among the top major market risk themes, so the fading uncertainty on those drivers naturally had traders leaning more towards high-yielders and riskier assets. This is likely the reason why we saw the euro outperform against the usual “safe haven” currencies (Swiss franc and Japanese yen) while losing out against the Loonie, Aussie, and Kiwi; typical behavior for this type of environment. Focusing on European catalysts, we didn’t really see any big sparks of volatility from European news, but the economic data did once again paint a picture of weakness in Europe with industrial production coming in negative at -0.9% on Wednesday, and falling at the fastest rate since the financial crisis. On Thursday, Germany barely escapes a negative GDP read, but the weaker exports due to a slowing Chinese economy can’t be a good sign for Europe. And overall, Eurozone GDP growth slows to 1.2% in the fourth quarter of 2018, down from the 1.6% read in the previous quarter. On top of the declining economic picture in Europe, we have negative stories from the political space with a “fiery exchange” in the European parliament as MEP Guy Verhofstadt called Giuseppe Conte, the Italian prime minister “a puppet” of his deputy prime ministers, Luigi Di Maio and Matteo Salvini. But the bigger political story causing concern may be the call for a snap election in Spain (the third time in four years) by prime minister Pedro Sanchez after losing a budget vote in Parliament. And by the way, the potentially disastrous Brexit situation is still at an impasse with a “no deal” Brexit scenario still a possibility. All put together, it’s understandable why we saw the euro tend to lean bearish as these headlines and data points to Europe possibly being a major weak link in the global economy. But again, risk sentiment and counter currency flows are likely the reason why the euro was able to come out on top against the pound, franc and yen while going read against the comdolls and U.S. dollar in a generally risk-on week across the globe. From Switzerland, we got the monthly read on consumer prices and producer prices, both coming in weaker-than-expected. 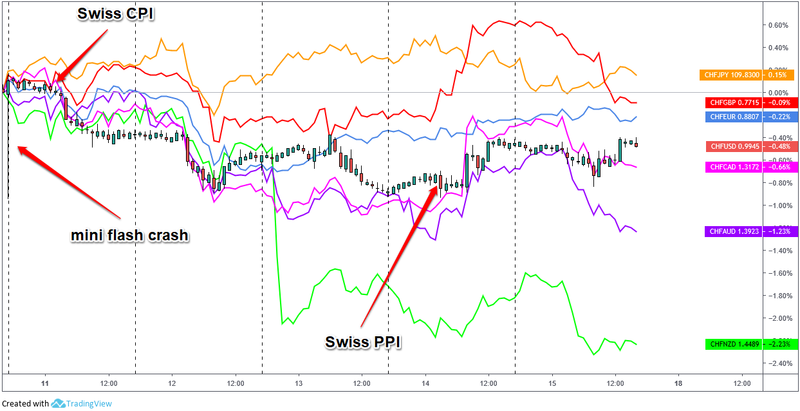 Looking at the one hour chart above of franc pairs, it looks like the CPI read could argued as catalyst for uniform movement as we saw broad selling following the data release, while the PPI read seems to be a dud as a market catalyst. 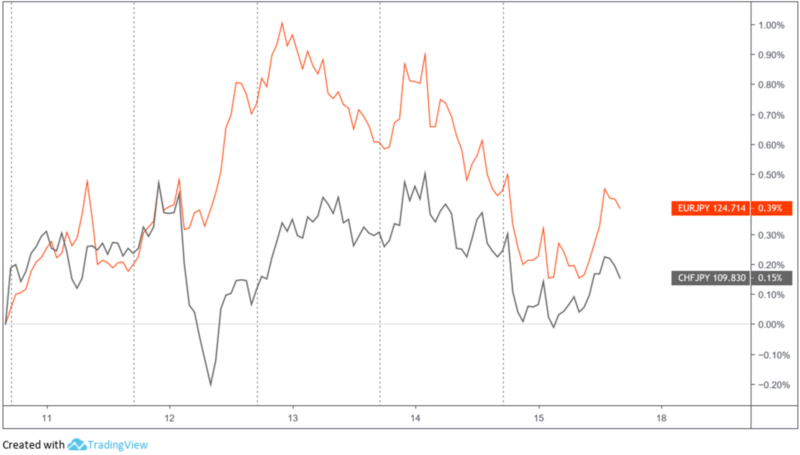 So as usual, it’s likely that global risk sentiment behavior was the main driver for franc pairs as the franc was only able to beat out the safe haven Japanese yen and a Brexit-weakened British pound during a “risk-on” type of week. And on counter currency flows as well, especially its usual correlation with the euro as seen below. Minus a drop in the Swiss franc during the Tuesday morning European trading session (which doesn’t appear to have a known direct catalyst), we can see that the franc traded nearly in step with the euro all week.